Sub, Hero, Grinder, Hoagie....call it what you want but for our Super Bowl party we are going to call it a dip. If you are looking for the ultimate game day snack food you've come to the right place. The Hoagie Dip recipe below combines all the ingredients of the classic Philly sandwich; served in a bowl with slices of bread for scooping. This dip won't last long, so be sure to make extra! Combine the chopped vegetables, meats and cheese in a bowl. 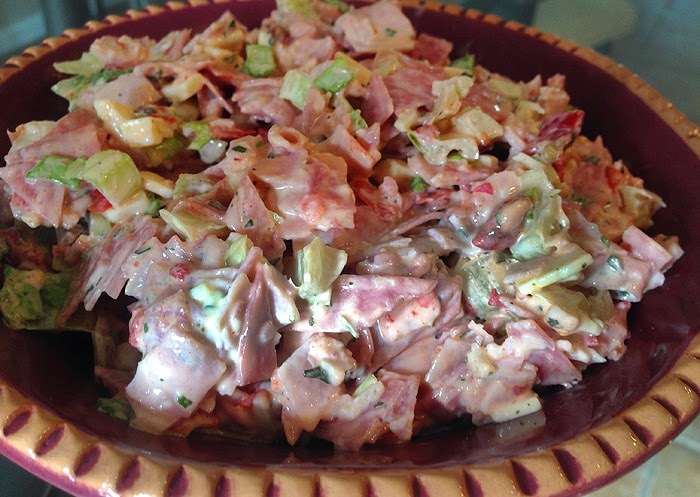 Mix the mayonnaise, vinegar, oregano, and red pepper flakes together and combine with the chopped meats. What a fun idea! It looks like the ideal dip for any football party. Dips are in for game day and this one sounds awesome! Fantastic idea! Especially nice for Super Bowl. oh this would be perfect to a party! Be still my heart. This looks amazing!! What a fantastic idea for a dip! The only problem is - I don't think I'd want to share it - it looks so good! Hoagie dip?? Omg my husband would be in heaven. All I can think about is the Huxtables! ;-) The dip sounds SO good! Holy cow - this looks crazy good! And it's now on my Super Bowl menu. I call them subs but since the hubs is from CT he calls them grinders. This dip looks awesome! This is fabulous. I try not to eat to much bread...you know, saving my carbs for the main course - dessert!